VI. 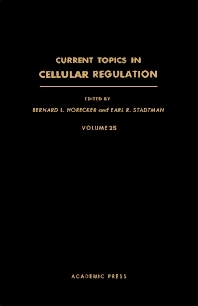 Sensitivity and "Control Strength"
Current Topics in Cellular Regulation: Volume 25 is a collection of papers that deals with GTP, the central regulator of cellular anabolism, and the quantitative approach to metabolic control. , Other papers describe the inactivation and aldolases by limited proteolysis by lysosomal cathepsin M, the regulatory functions of proline, pyrroline-5-carboxylic acid, as well as the characteristics of a hormonal regulation of amino acid transport. One paper suggests that GTP, possibly acting through high guanine nucleotide energy charge, acts to stimulate a wide variety of anabolic processes involved in cell growth or proliferation. Another paper proposes that lysosomes are responsible for the degradation of proteins and other macromolecules, and in regulating cytosolic enzymes. This action is due to the presence of selected proteinases (located on the outer lysosomal surface) that are active at neutral pH, and also which catalyze only limited proteolysis of cytosolic proteins. One paper describes the characteristics and hormonal regulation of a specific transport system for neutral amino acids, namely, the System A-mediated transport. The collection can prove beneficial for biochemists, micro-biologists, bio-physicists, cellular researchers, and academicians involved in the study of cellular biology.